Get a pen and write this down. I began in the book business 26 years ago. In that time I have grazed over the pages of a million books like a contented cow munching on green grass over the entire Western hemisphere. No, don’t write that down! Wait. I have decided to have my own book club and it works like this. I draw from my 26 years of experience in the book business and mention four books highly worth reading and you have the entire year to read them. First of all, I think it is very interesting when writers appoint themselves as God and create busloads of characters and put words into their mouths and mold these people into a story they think will sell or they think we, the readers, will be interested in. Now just suppose a writer came along and let people voice what is inside them instead of speaking for everyone! Imagine a book with hundreds of people releasing their inner stories openly and naturally and not like bugs pinned to the Styrofoam of some egomaniac. There is such a book. 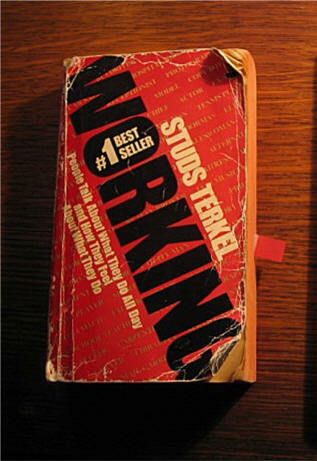 My first recommendation is Working by Studs Terkel. I found that it is not only refreshing but it also acts like therapy because you read the accounts and suddenly find yourself more connected with people everywhere. Just try it; you’ll see what I mean. It’s like you suddenly realize people are not shallow, stupid, cardboard-like and boring. No, that’s what TV and novels make people. If you really enjoy Working then by all means go out and get another of Turkel’s books, American Dreams Lost and Found. Superb, superb, superb! Ok, did you write that down? George Orwell wrote something of a children’s parable to answer the question: How do idealistic people working to change the political order get turned into the opposite of what they were once they themselves taste political power? 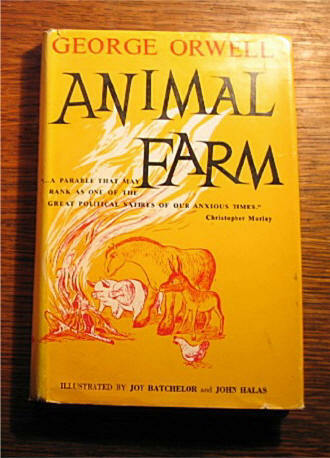 The publisher didn’t think the book would have a big audience, but Orwell apparently touched a universal nerve when he wrote Animal Farm. This is a true story that has occurred all over the world time and time again. Orwell died a couple years after Animal Farm and 1984 were published. If he had lived, I wonder if he could have written another book, this one about how a few people who govern many can be kept clean, honest, and idealistic without selling out and without the money and power they touch destroying them. The third book I would like to recommend is quite popular at the moment. The author, Jared Diamond, just came out with a sequel: Collapse. 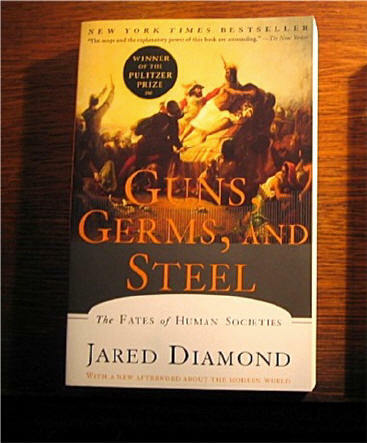 I haven’t read it yet, but I recommend his very well received earlier book: Guns, Germs and Steel. (A pared-down version is available on CD and is a wonderful companion on long, dull commutes to work). Diamond has spent the better part of 25 years answering the question, why some peoples or nations have advanced and dominated others. Why did some become more powerful and obliterate others? His answers are not narrow racist stereotypes. Instead, he argues convincingly that germs played a bigger role than guns, and that the natives of Papua New Guinea are more intelligent, better adapted, and more in harmony with their environment than couch potato westerners who are growing soft inside. Jared Diamond has plenty more to say, and he is well worth listening too. In a way he does for world cultures what Howard Zinn did for United States history — he sets the old presumptions on their ear! The last book I would like to recommend is a personal memoir by a Mexican-American woman who grew up in Los Angeles. I think she has the talent and the poetic touch that Sandra Cisneros should have acquired if she hadn’t gotten so conceited and full of herself. (Maybe this is the Animal Farm syndrome for writers: they taste success early and it completely destroys them.) 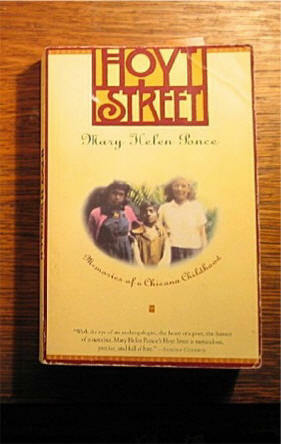 The woman I recommend is Mary Helen Ponce, and her wonderful book Hoyt Street takes you into the world of a struggling immigrant family trying to get a foothold in an often unfriendly land that happened to be stolen from their forefathers. Last I checked, this book had fallen out of print so I recommend you get a used copy from one of the many thousands of independent book dealers that list on www.abebooks.com. All you do is find a copy, email to see if it is still available, and either call the store up and use a credit card or send them a check. Did you jot that down?